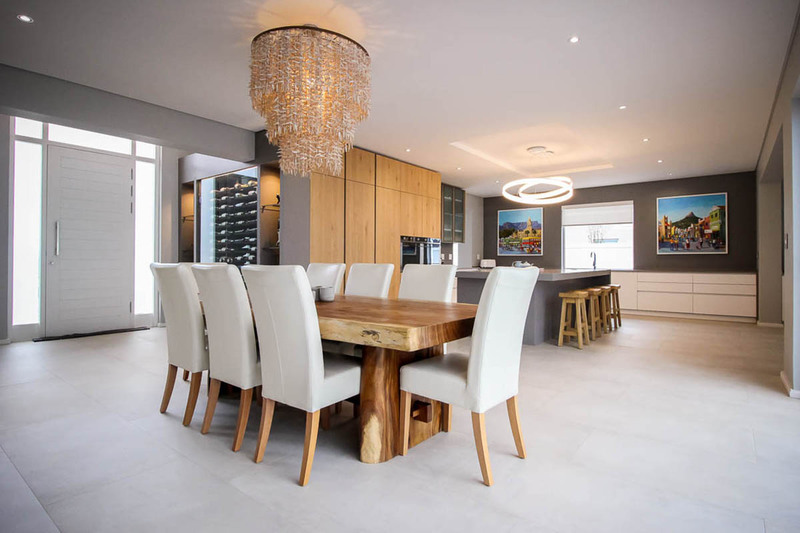 When Rudi and Lynn Eggers started building their family home in Franschhoek’s Val de Vie Estate, they were drawn to the beautifully balanced lifestyle it offered. With a perfect mix of luxury living and lush vegetation, they were also swayed by the wide-open spaces and many surrounding wine farms that let you experience the beauty of Cape Town’s culture. One of the non-negotiables for Lynn, was to create something different to their Durban home. 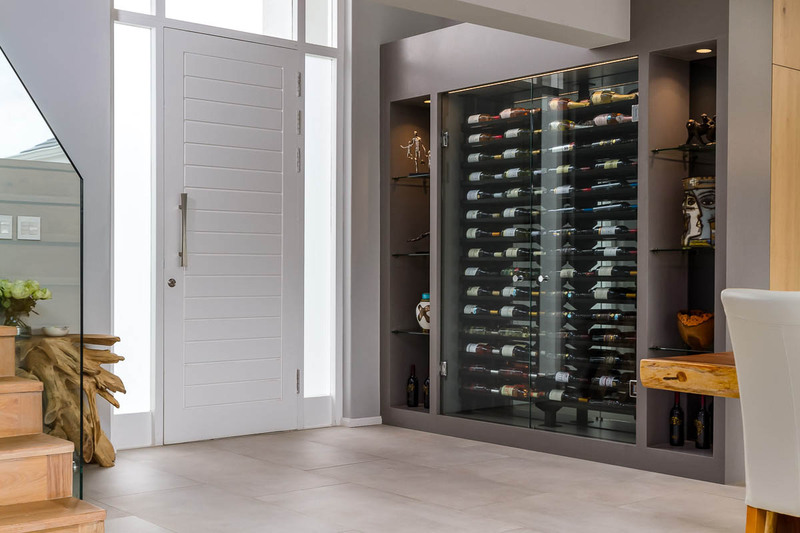 Fitting/appropriate to its humid sub-tropical climate, their Umhlanga Ridge home offers cool, crisp, white interiors, but Lynn was eager to embrace the varying seasons of the Cape to create a warm, welcoming home. With the help of Vanderbilt Construction and Icon Architects, the Eggers saw their vision of a new family residence take shape. From the moment you open the front door, the beautifully considered interiors draw you in. With large glass windows throughout, the home is filled with natural light. 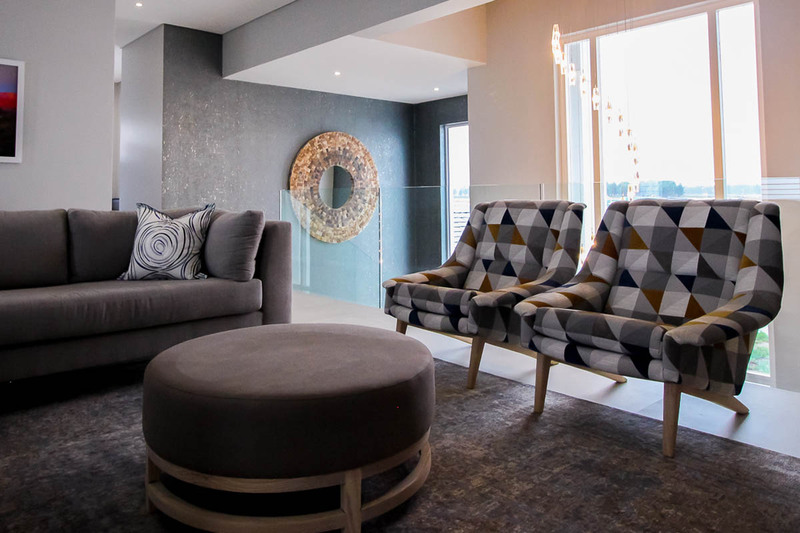 Grant Horak, from Horak Venter Designs worked beside Lynn to welcome the outdoors in and incorporate interesting snaps of colour and deep textures on a grey-toned foundation. With an incredibly clever selection, each area is anchored by a signature piece that dictates the style, making the space unique. Elements of high-glamour are offset by a pared-back elegance that reflects the couples personal style and charisma. With fully-integrated appliances and a free-standing island the Eggers’ kitchen was designed by Assirelli and is positioned front of house, acting as the prop that brings all the elements together. No longer a space for merely cooking, this kitchen was designed with functionality in mind and also caters for entertaining, catch-ups and even a working space if need be. Their taste in, and support of, local art is also reflected throughout the home. Hanging authoritatively in the kitchen and bar area are vibrant paintings by Pretorian artist Willie Strydom, that were organised by The Vineyard Gallery in Franschhoek. In other parts of the home are large photographic prints by Grant Laversha, who is known for his scrupulous style and creative usage of natural light. 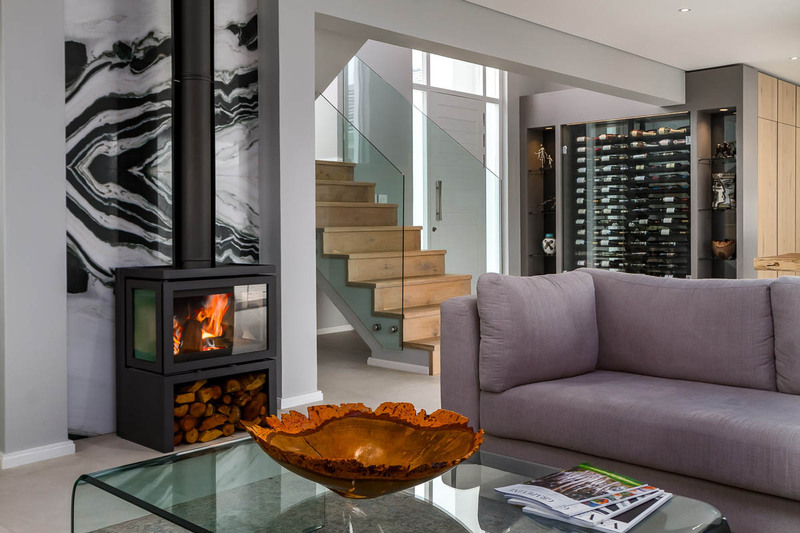 But it is not just the art that adorns the walls that offer exquisite talking points… On entering the home you are met by an unmissable floor to ceiling wine rack, followed by a jaw-dropping book-ended Panda marble that occupies the wall behind the fire place. The bathroom, as it is known today, is best viewed as a sanctuary. A place curated for personal well being, where you can escape and revive. In this instance, the four bathrooms each hold pride of place. 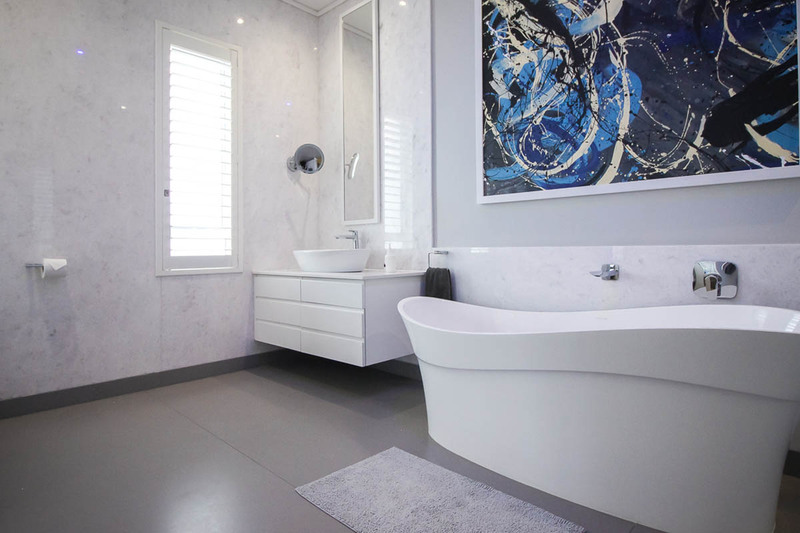 Three of the bathrooms have wall-cladding in decadent Bianco Ciello marble from Vietnam.  As the Managing Director of International Slab Sales, it was no surprise that Rudi’s passion for natural and engineered stone came through in the finishes, with marble flawlessly in various applications. 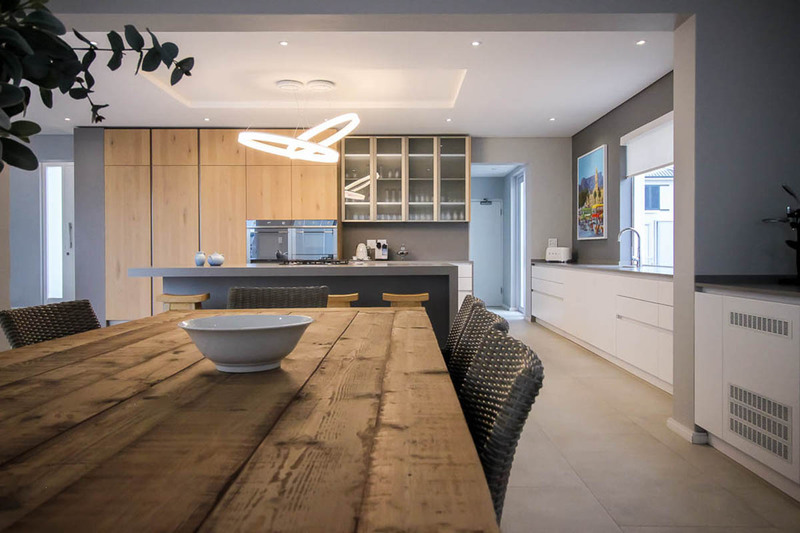 With a lovely juxtaposition of engineered stone, natural elements and the mix of colours on grey foundations, this light-filled home has a grounded, contemporary-chic feeling to it. With a large family and a love for entertaining, the open-plan design ensures that this home will always be able to welcome guests and good times.